Your scouting days may be behind you, but that is no reason to give up vying for merit badges! 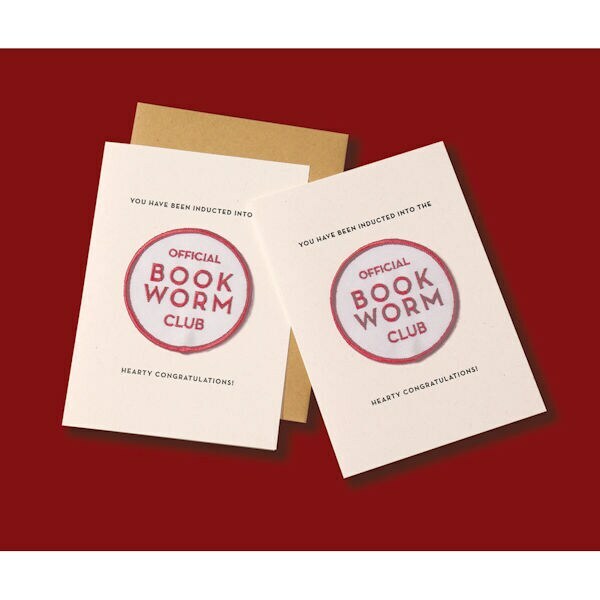 Our cute Book Worm Patch Note Cards - which read "You have been inducted into the Official Book Worm Club. Hearty congratulations!" - are festooned with a special red-and-white patch proclaiming your literary prowess. Simply peel off the iron-on patch from the front of the card, then affix it to your garment of choice via the printed instructions. We're offering a set of two of the blank 5"x7" cards (with envelopes) so you can share with your book-club buddies, thank the dedicated librarian you know, or encourage a reluctant reader!